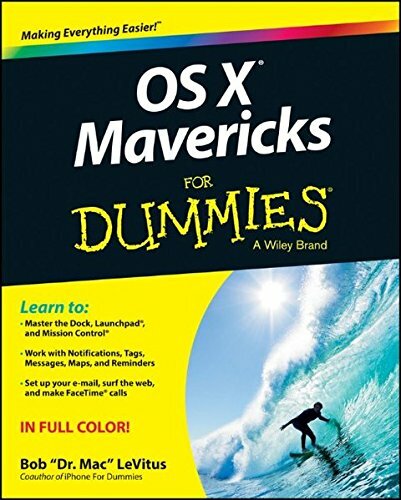 Coast through OS X Mavericks with help from Dr. Mac and For Dummies Ready to make friends with Mavericks? Then, Dr. Mac s your man. Author and longtime Mac guru, Bob Dr. Mac LeVitus shares his witty insights and helpful tips in this full-color update to his bestselling OS X guide. Coast through OS X Mavericks with help from Dr. Mac and For Dummies Ready to make friends with Mavericks? Then, Dr. Mac s your man. Author and longtime Mac guru, Bob Dr. Mac LeVitus shares his witty insights and helpful tips in this full-color update to his bestselling OS X guide. You ll learn the basics of working with the Dock, Launchpad, and Mission Control before moving on to setting up your e-mail, surfing with Safari, organizing your files, and customizing OS X Mavericks for all you need your Mac to do. * Familiarizes you with OS X essentials like navigating the desktop, connecting to a network, using Notification Center, managing your Contacts and Calendar, staying in touch with Messages and FaceTime, and syncing with iCloud * Covers new-to-OS X tools and features including iBooks, Maps, iCloud Keychain, Finder Tabs, and Tags plus the streamlined Calendar, Notifications, and Safari applications * Explains how to turn your Mac into a multimedia mecca with music, movies, podcasts, photos, videos, e-books, and your favorite apps and games from the Mac App Store * Provides troubleshooting tips, advice on customizing and maintaining your Mac, and keeping your information safe and secure Whether you re dipping your toe into OS X or leaping full on into Mavericks, For Dummies will help you make the most of your Mac and all Mavericks can do for you.